I don’t know how to say this without sounding like a geek, a noob, or both. I don’t care. I’m happy. I’ve just captured a noise print. CAUTION: This article is rated T for Techie. May contain explicit references to recording devices, digital nonlinear editing, waveforms and gaffer’s tape. Ginny’s interview shows in Audition’s Waveform Editor. 38″x70″ Ethan Allen pine trestle table, the repurposed dining room furniture. The numbers 648 and 49 are engraved where my eldest child quietly did his homework. Point is, I’ve learned to zap the wind. Adobe has this wonderful program called Audition. It comes in the Production Premium suite along with Premiere Pro and several other high-octane programs. In Audition, the bad noises go bye-bye. You go into the Waveform Editor, make a noise print and noise magically disappears. 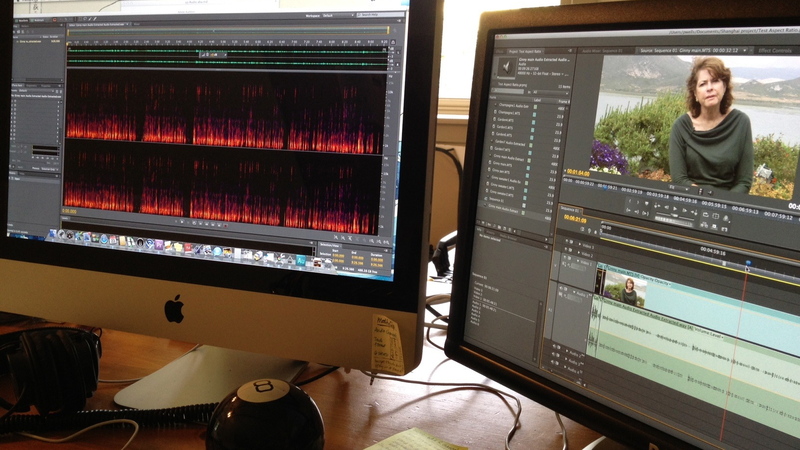 Premiere Pro has its own noise reduction toolbox. Audition has Home Depot. Back in June, Joan and Ron and I had hoped to interview Virginia in a beautiful spot overlooking the estuary. This was a property owned by one of her neighbors, and we would use it if the weather cooperated. It didn’t. But even though it was too chilly for Virginia, her daughter Ginny was game. The kids down the street. I’d forgotten about them. While Ginny was on camera, I was not aware of the children chortling in the background because I was focused on her. I must’ve tuned them out, this being a skill I developed while raising three boys. I heard them later, going through the clips. Well, I’m not worried. You can’t expect to control everything on location with a documentary film, especially kids. I can see where a roll of gaffer’s tape might’ve come in handy, but never mind. I’ll zap them in post.